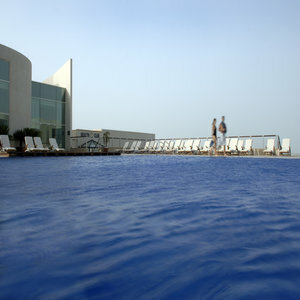 All rooms enjoy a view of the city skyline or Arabian Gulf. Luxury amenities include a state-of-the-art gym, plunge pool, outdoor pool, sun terrace and four tennis courts. Savour the famed Fishmarket restaurant or relax at the Yacht Club, overlooking the hotelÃ¢â¬â¢s private marina. Explore nearby Heritage Village or browse the cityÃ¢â¬â¢s best malls.